The Saco, Maine, native and now 20-year Boston area resident has toured extensively, playing a number of diverse venues ranging from Chicago’s legendary Old Town School of Folk Music to the White House. Her latest release, “Stretch Limousine on Fire,” harnesses the energy of her concerts and was recorded live in Los Angeles’ Stampede Origin Studio. The vibe is spirited, unique and best embodied by the album’s title track. “Stretch Limousine on Fire” is an infectious tune whose central theme takes on the idea that “when bad things happen, you sometimes take comfort in realizing they happen to everybody.” It’s this mastery in translating universal life experiences that earned Curtis the 2006 International Songwriting Competition and appeals to her legions of dedicated fans. Curtis has her hands full this summer organizing a fall 2012 concert series, officiating non-traditional wedding ceremonies, and tending to the full-time job of raising two daughters with her partner, Liz Marshall, but we caught up with her as she summers on the shores of Lake Michigan. In looking at your tour schedule online we can draw one of two conclusions—either you’ve chosen to stay close to home all summer to be with the kids or you need to fire the person who updates your website. Which is it? I love to take the summer off! I am playing a couple of festivals and I’m officiating a wedding, but other than that I summer on the shores of Lake Michigan with my wife, kids, two pugs and their two little pug life jackets. Okay, maybe not the life jackets. We read that you’ve been busy preparing for the “Voices United for Separation of Church and State” concerts that will take place all over the country in late September and early October. What can you tell us about that effort and how did a New England-area native like you ended up booking a Los Angeles show for the event? I have been a supporter of Americans United for Separation of Church and State (A.U.) since I met the Executive Director, Barry Lynn, several years ago. I am organizing over 50 Voices United Concerts, most of which are house concerts. (www.voicesunitedconcerts.com) There will be concerts in every state to raise awareness and funds for A.U. 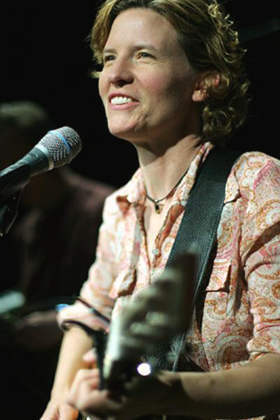 One of the first musicians who agreed to play was Mary Gauthier. She told us she was free on October 1 in Los Angeles, so I said, “Okay, we’ll look for a house concert host and I’ll do it with you.” Now it has morphed in to a show with Mary Gauthier, me, Sarah Silverman and others at the 500-seat El Rey Theater. You recently attended Boston Pride. Tell us about that. For many years I’ve performed at Pride marches. This year I was home, so I took my daughters and we watched the parade together. I was overwhelmed by the beauty of the event. Boston Pride is so inclusive now, and is quite family friendly. It’s enormous. I got the sense that the foundation of support for gay rights is wide, deep and incredibly stable. It’s so different from the 1980s. What would you say is your favorite Pride event memory? Watching my daughters watch the dykes on bikes and knowing that they are like, “So what? Women who look like my mom’s friends riding motorcycles? That’s it?” They are growing up in a culture—family culture if not wider culture—that celebrates a wide range of gender identity/expression. You’ve had a prolific career producing 11 CDS since 1995. We’re going to put you on the spot and ask you to name your favorite track off each CD. Ready, set, go! The New Yorker magazine dubbed you a “folk-rock goddess.” Do you still have to help clean up the kitchen after dinner, take out the trash and other non-goddess-like activities at home? That’s what the pugs are for. You tweeted not long ago that your seven-year-old asked you what a phone book was. Have you attempted to broach tougher subjects like drive-in movies and pay phones with your girls yet? Recently we heard a Beatles song and I asked nervously, “You guys know that’s the Beatles, right?” and Lucy said, “Yeah, they’re from the 1900s.” Ouch! Honestly they’d have no idea what to do with a pay phone. They have enough trouble dialing from a landline. Is it true that your first guitar was a conditional gift, furnished with the proviso that you learn to play it? Who should we thank for that act of generosity and foresight? Yes, a woman named Lynne Ramsdell gave it to me. The whole story is on my website—it’s kind of a long one. Which musical artists have influenced you the most? Lucinda Williams, Ani Difranco and Bonnie Raitt—all strong women who are not afraid to be themselves. We read that your “Aspire to Inspire” program which provides guitars to underprivileged youth had run its course, with all funds from the initiative expended. However, we heard that you plan to start another program. Is there anything you can tell us about that at this point? I would love to facilitate an instrument swap through my website, whereby people with unused instruments would be matched with underprivileged youth who really want to play. I have a lot of ideas and not enough time! So what lies ahead for you—is there another CD or tour in the works for late 2012 or sometime in 2013? I am planning to release a holiday CD this fall/winter, recorded around my shows at the White House in 2010 and 2011. I’m currently working hard organizing the Voices United Concerts which are coming up in September. After that I think I’ll be taking a deep breath, writing music for a new CD and getting ready for the holiday music tour. In the meantime, I am booked for several weddings this fall. I am ordained through the Universal Life Church to officiate weddings, so I marry people—usually women—and play songs for the couple. It’s always a privilege to be part of that special day. Finally, if someone were to pen your unofficial biography, what would it be titled? Posted July 9th, 2012 & filed under Entertainment, Interviews.